Tweet There’s a lot of great guitar players out there, but in the era that started in the later 90’s early 2000’s through today, two guys have really stood out to me, not just because they’re good, but because their playing style is so definitive and that’s Clint Lowery and Mark Tremonti. Clint’s juggling four different projects right now. Dark New Day just released their “second” album “New Tradition,” he and Morgan Rose just finished up their project Call Me No One. On the side Clint does his acoustic thing Hello Demons Meet Skeletons and then there is obviously Sevendust. Clint called his newest project Call Me No One because he views himself as the anti hero to rock music. I can see that. Zoiks! : Hey Clint, how are you doing? 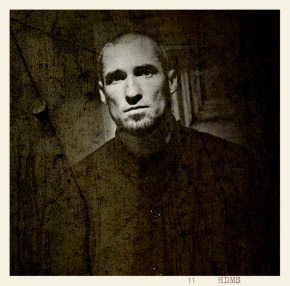 Clint Lowery: Not too bad, how about you? Z! : Pretty good, thanks for taking the time to do this, I know you’re busy writing and recording with Morgan (Rose) right now, so I really appreciate your time. CL: No worries man, I’m actually heading downstairs to meet with him right now. Z! : I got a chance to listen to "New Tradition" from your band Dark New Day. I love the album, what made now the right time to release the album? CL: There were a few things. It was actually a few conversations I was having with some of the guys about everybody always asking about a new Dark New Day record and wondering what happened. Recent conversations over the last six months we were just like, the Warner Brothers thing was just a very cloudy situation and how they released us. Once we were out of the woods with them and that whole thing we realized we had recorded a bunch of music on our own that had nothing to do with Warner Brothers. We were in contact with Goomba Records and they showed some interest in releasing it. Once we had some contact with them we figured it was a very minimal amount of effort really to put it out, especially if Goomba Records was going to help and do all the leg work then we could all maintain our main bands and put together the songs that we thought were relevant and cool. We remixed a few of them and mastered and we just thought this would be the best time to do it. There wasn’t that much thinking going into it. We just thought it’d be a shame for these songs never to see the light of day. After enough time passed with the Warner Brothers thing we just figured we’d do it ourselves. Z! : You mentioned that you all were able to maintain your main bands. What is the status of Dark New Day? Does it exist? CL: It exists in a way. There’s so much music we recorded that was never released. We stay in pretty decent communication with one another, but it’s not an active band, we’re not out there pushing and making it a number one priority, but if the moons line up enough for all of us to go out there and play some shows to support it we definitely want to do it. We’re kind of interested to see what happens. If it comes out and people respond really well to it, then we’ll respond to that. If there is a demand for us to play shows, then we’ll go play them. It’s going to have to be anticipated by people, we’re not going to go out there and hustle it to try and make it happen. If people are into it, then we’ll go out and play. It’s pretty much up to the people. Z! : I’m really excited this new project you’re working on with Morgan, Call Me No One, can you tell us a little bit about how that’s going? CL: Yeah, it’s crazy because we’re still developing it ourselves. It’s not really a heavy recorded, but it’s not a light record like the HDMS (Hello Demons Meet Skeletons) stuff I do. It’s somewhere in the middle. Some of the songs are pretty progressive, some of the songs are just rock. It all has a dark spooky twist to it; kind of Nine Inch Nails meets Foo Fighters. It’s cool. We’re still putting it together; we have about eight songs musically right now that we’ve tracked. We’re going to try for about four more. We only have 30 days to do this whole record, to write it, track it and mix it. It’s really unheard of to get this much work done. We have an idea of what we want to do, we’re under a lot of pressure, but it’s coming together nicely. Z! : How did the project come about? CL: Morgan and I just, for years, loved talking about different directions and things we couldn’t do in Sevendust. I hate to say it like this, but there is a ceiling with what we can do as Sevendust. We’ve done so many records, with that particular formula there is only a certain amount you can do musically. There is nothing wrong with that. There is a lot fulfillment within Sevendust and that whole process. We all love each other, the guys are great, the music is fun and the energy is really good. We felt like it was time to explore a little bit beyond Sevendust. I’ve always wanted to go and do a record and Morgan showed a lot of interest in helping me. We just decided to partner up. We’re going to try and make a band out of it and make a go at it while we have some down time in Sevendust. We’re not trying to set any expectations; we’re just trying to make a good record. Z! : When do you think we’ll be able to hear something from that? CL: I would guess probably in March…pretty quick. We’re going to finish it this month (February) and it will be released on the same label as Sevendust. I’d imagine the single and the first song that will be downloadable will be in the middle of March possibly. Z! : You mentioned making it a band, do you think you’ll take Call Me No One out on the road? CL: We will for sure. We will definitely do some shows. We’re excited about that; it’s going to be fun. We’re going to get a bass player and a guitar player and try to keep the face of this as a band and not a two man show that’s a side project. We really want to nurture it and see what comes of it. Z! : When it comes to guitar players from your generation, you and Mark Tremonti are the ones that stick out for me. You both have a unique playing style which I think style mixed with technical ability is what makes a great guitar player. Is your playing style something you consciously work on developing or is it more natural? CL: My dad was an amazing guitar player…still is. I think there was some natural ability there, some natural elements that I grew up around. It’s like you said, its two things, its discipline. Mark is a very disciplined guitar player. He plays a lot more than I do. I go through phases where I play a lot as well. Some of it is talent and the natural ability to pick out notes and to hear things and to make choices as to where you go on the fret board. There’s the ability to get your muscle memory and your hands capable of doing the things your mind thinks of, you just have to practice. Z! : As a songwriter who is involved with several different projects and constantly writing, do you write to a specific project or do you write based on your mood? CL: The project we’re doing now came from mood writing. I was just writing these dark kind of spooky riffs. Then you start to build a little library of songs and that’s when I think I really want to make a project out of this or a Sevendust record out of this. It’s all just from ideas. Now there is a specific ideal of what I want to do and that’s what we’re working on, a specific sound and direction we’re trying to work for. Z! : I was reading your blog entry last week and I loved the reason behind calling this project Call Me No One, could you tell our readers what made you decide to call the project Call Me No One? CL: It’s about humility. I’ve always been the kind of guy that’s in the background on things. There’s always been a Lajon (Witherspoon) or a Brett (Hestla) or singers like that. I see myself as a pretty regular person and that is basically what the name is, Call Me No One. At the end of the day it’s about the humility of it and the mystery of it. I’m a very human singer. Z! : One last question for you, Sevendust is planning on getting back into the writing mode around June. The rumor is this could be the last album for Sevendust, do you think this will be it for Sevendust? CL: I don’t know, there’s always a chance for that. There was a chance for that after the second record. We don’t take that lightly. It’s a decision we’ll want to make as a band and end on our own terms. I think the train of thought is based around that. If we do go out we want to go out on our own terms. Realistically looking at stuff like, we’ll do another record in June, that’s two more years of touring. There’s certain guys with families, all of us have kids. It’s one of those things we’re trying to be realistic about. We don’t want to say it’s our last one but there is a chance that it could be. If it is we want to end it on our own terms. It’s not like we’d leave because we have to. Z! : Thank you so much for taking the time, I don’t want to take anymore of your time. I’m really looking forward to hearing something from Call Me No One and I really enjoyed the new Dark New Day album. Thanks again for taking the time.